Albert William Kaline was born December 19, 1934, to Nicholas and Naomi Kaline in Baltimore. His father, a broom maker by trade, was a semipro baseball player, and began working with young Al to develop a pitcher’s arm. Nicholas would squat down, while his son threw a variety of pitches. By the time he was nine, Al had learned a fastball, curveball, and changeup, and the work paid off. Kaline, while pitching for Westport Grammar School, won 10 straight games. The legendary arm strength and accuracy that would make Kaline one of the most complete ballplayers of his time was evident early on. During a picnic festival, Kaline threw a ball 173.5 feet. The disbelieving judges ordered him to throw again, believing that the measurement was off. Kaline threw again, this time 175 feet. While developing his arm, Kaline also learned to overcome osteomyelitis, a chronic bone disease that forced the removal of diseased bone from his left foot. To combat the physical impairment left behind, Al taught himself to run on the side of his foot. The determination to overcome injury became a trademark of Kaline’s career. A freshman at Southern High School in Baltimore 1949–1950, he tried out for the football and basketball teams. He quit football midway through the season when he broke his cheekbone, but in basketball, he led all scorers as a freshman. When spring came, Al tried out for baseball. Coach Bill Anderson immediately noticed Al’s pitching, but because there was no place for Kaline as a pitcher, Anderson began teaching him to play center field, with the idea that Kaline would play one year of junior varsity ball and move up to varsity as a sophomore. That idea was short-lived, however, as Anderson placed Kaline on the varsity after watching his defensive prowess and offensive skills during a practice game. Position changes would follow Kaline to the majors as well. Scouts from every major league team followed Kaline’s every move. They watched as he hit .333 as a freshman and .418 as a sophomore, improving his defense as the year went on. After his sophomore year, Kaline was chosen in 1951 to play in an annual game sponsored by the Hearst newspapers, played at the Polo Grounds in New York. This game became a proving ground for Kaline, who hit two singles and a home run, and was named most valuable player. The next day, Kaline traveled to Yankee Stadium to watch his first-ever major league game, as the Yankees took on the St. Louis Browns. Despite two great seasons in high school ball, the best for young Kaline was yet to come. He hit .469 as a junior and .488 as a senior to go along with his stellar defense. The combination earned Kaline more attention from the major leagues, specifically the Brooklyn Dodgers, St. Louis Cardinals, Philadelphia Phillies, and Detroit Tigers. Tigers scout Ed Katalinas had followed Kaline’s high school career, and was determined to make him the next Tigers great. When asked about Kaline’s ability, Katalinas said, “To me he was the prospect that a scout creates in his mind and then prays that someone will come along to fit the pattern.” Katalinas watched as Kaline played in seemingly every recreational ball league Baltimore had to offer during the summer, even hitting .609 one year in American Legion ball. The Tigers had finished the previous season last for the first time in franchise history, and were determined not to repeat that performance. Katalinas tried desperately to persuade Tigers president John McHale Sr. to sign Kaline, but McHale was more interested in pitcher Tom Qualters. After Philadelphia signed Qualters, the door was open for the Tigers to sign Kaline. Katalinas wrote McHale asking that he fly to Baltimore to watch Kaline play in person. McHale did, and was so impressed by Kaline’s abilities that he immediately flew back to Detroit to get permission from Tigers president Spike Briggs to sign Kaline to a bonus contract. Briggs agreed, and Katalinas was given the task of signing Kaline. Players could not be contacted by major league clubs until after high school graduation. The day after Kaline’s graduation, Katalinas descended upon the Kaline residence with a contract in his pocket. Katalinas was greeted by Nicholas and Al, but was quickly left alone with the young player. Katalinas offered $15,000 in bonus money and $20,000 in salary over three years. Kaline discussed the offer with his parents, and agreed to the contract. He later said the bonus money helped pay off his parents’ mortgage and his mother’s eye surgery. Al signed the contract and turned it over to his father, who was also required to sign. Before Nicholas could sign, Al said he had promised to play in an Amateur Day game in a few days, and asked if he could still play. Katalinas realized then that he had a special talent in the young Kaline—not only with baseball, but with life. He knew Kaline would never break a promise, and agreed to let Al play. Nicholas then signed the contract, and Al Kaline became a Detroit Tiger. Since the bonus was more than $6,000, Kaline was assured he would be with the big-league club for at least two years. Kaline’s first brush with greatness occurred later in 1953 when manager Fred Hutchinson introduced the budding star to Ted Williams. Williams spent ten minutes with Kaline, giving him tips on how to hit low balls, and on off-season workouts like swinging a heavier bat and squeezing a baseball. Williams’s advice became a trademark of Kaline’s game, especially his off season. The hitting advice Williams gave Kaline was on display September 16 when Kaline started his first game, this time in center field. He rapped out three singles and drove in his first run in an 8–3 Tigers victory over the Boston Red Sox. Kaline continued to show flashes of brilliance, even getting a hit off the great Satchel Paige in a game against the St Louis Browns. Kaline’s first home run came during a ninth-inning pinch-hitting appearance at Cleveland. Although Kaline played in only 30 games, he had done enough to impress Hutchinson. According to a 1953 Sporting News article, the Tigers worked with Kaline at second base and shortstop, but eventually kept him in the outfield. After the 1953 season, Kaline returned to Baltimore to work during the off-season in a sporting goods store, allowing him to take Williams’s advice and squeeze a baseball during the day. While on breaks, Kaline would take a bat in the backroom and swing until his arms got tired. He also continued dating his high school sweetheart, Madge Louise Hamilton. Al was attracted to her not only because of her beauty, but also because she could talk baseball. Just before Kaline left for spring training, he proposed to Louise, who accepted. They were married after the 1954 season. While playing winter ball in Cuba, everyday outfielder Steve Souchock broke his wrist, allowing Kaline to get valuable spring training time in right field. It was assumed that Souchock would be the starter in right when his wrist healed and Kaline would return to the bench. But Souchock’s wrist didn’t heal, and the 19-year-old Kaline became the starting right fielder in 1954. Kaline impressed everyone that season with his defense, and his offense soon became adequate; he hit around .250 for most of the season before the All-Star break. After the break, Kaline went on a tear and increased his average to .283 by the end of August. About a month later, in a home game, Kaline suffered his first major injury. A fly ball hit toward right at Briggs Stadium had Kaline racing toward some box seats that poked out into foul territory. Kaline ran into the wall protecting the seats, and was knocked out. He also twisted his knee and was hospitalized for five days. After the incident, Tiger president Spike Briggs ordered the seats removed lest Kaline be injured again. Kaline finished up his first full season with a .276 average. His lack of power, though, was a concern. Kaline had only 25 extra-base hits, including four home runs, and only 43 runs batted in. Kaline went into the off-season knowing he had to improve his prowess at the plate. He didn’t disappoint the fans or new manager Bucky Harris that year, even earning comparisons to Joe DiMaggio. On April 17, he blasted three home runs, including two in the sixth inning. By the end of April, Kaline had a 14-game hitting streak to go with a .453 batting average. He was voted by the fans as the American League’s starting right fielder for the All-Star Game. After the break, Kaline continued to hit. By the end of July, Kaline was leading the league in batting average, runs, runs batted in, hits, and home runs. The hot hitting continued until the beginning of September, when Kaline fell into a slump. To help himself out of it, Kaline focused on the fact that he was only a few hits away from 200 for the season, and that if he achieved that plateau, he would be the first Tigers outfielder in 12 years to have 200 hits. Kaline broke out of the slump, and ended the season with exactly 200 hits. He won the American League batting championship with a .340 average. Kaline, at the age of 20, was one day younger than Ty Cobb when Cobb won the batting title in 1907, making Kaline the youngest batting champion ever, a mark that has endured for more than a half-century. The comparisons to DiMaggio that had followed Kaline all season were summed up in the October 5 issue of The Sporting News, which outlined how Kaline was more similar to DiMaggio than Cobb. Before the 1956 season, Kaline bulked up—perhaps due to being on the “banquet circuit.” In an effort to become more comfortable with reports and the public, Kaline made as many appearances as possible. Early in the season, Kaline seemed to be uncomfortable at the plate because, according to manager Bucky Harris, he was reaching too much for pitches and being too impatient. Kaline had put extra pressure on himself to follow up his amazing 1955 season. Despite his slow start, Kaline was voted to start the All-Star Game for the second straight year. During the festivities, Kaline sought out Ted Williams, who reaffirmed what Harris had already told him: He was pressing, and needed to be more disciplined at the plate. After that, Kaline went on a tear, and raised his average from .276 to finish at .314. During the off-season, the estate of Spike Briggs’ father sold the Tigers to an 11-man syndicate headed by radio station owners Fred Knorr and John Fetzer. Briggs stayed on as general manager. Before the 1957 season, Al Kaline met businessman Frank Carlin, who offered Kaline and Detroit Red Wings forward Gordie Howe positions in a new business venture. Howe and Kaline were to be salesman gaining subcontracts for automotive parts design. Kaline was reluctant, but Louise was certain it was a good venture, which is all Al needed to hear. Kaline, Howe, and Carlin formed Michigan Automotive Products Corporation (Mapco). Kaline was vice president, and found the business easier than he had originally believed. The business was so successful, the trio also formed Howe-Kaline-Carlin Corporation. The off-season was not without controversy, though. Kaline believed he deserved a raise, as did Briggs, but Briggs did not offer a figure near what Al wanted. Briggs sent Kaline a contract, which was reportedly sent back unsigned, without a note. Briggs was insulted, and declared in a speech that Kaline thought he was as good as Mickey Mantle, and wanted to be paid as such. Briggs said he was offended by the returned unsigned contract, which he said included a $3,000 bonus, and Kaline returned it without an explanation, and without a holiday greeting. Kaline eventually got his contract, but the price he had to pay was larger. Many fans viewed Kaline as an ego-driven player, and many reporters implied as such with pointed, sometimes hostile questions. Kaline became so upset that he began to ignore the press, becoming more introverted than he already was. The 1957 season was successful for Kaline. As in 1956, he started slowly, but was still chosen to start in the All-Star Game. Again, as in 1956, after the All-Star break, Kaline began to hit, and raised his batting average to .300 near the end of August. His success was coupled with the birth of his first son, Mark Albert, on August 21. Kaline’s strong hitting and stellar defense helped the Tigers finish fourth, and gave Kaline his first of 10 Gold Gloves. 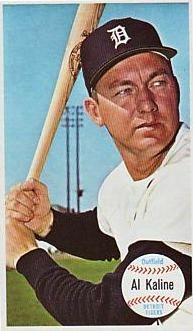 Kaline repeated his strong hitting and stellar defense in 1958, as he hit .313 and earned a second straight Gold Glove as the Tigers still finished fifth. The 1959 season was one of change and of improvement for Kaline. He was shifted to center field after regular Harvey Kuenn was hit on the arm. Kaline preferred right field, but played well in center. When Kuenn returned from his injury, new manager Jimmy Dykes kept Kaline in center and moved Kuenn to right. Kaline thrived in the new position, and began to show signs of being a gritty and tough leader. After being hit in the cheek by an errant throw, Kaline sat out five games. He began to get restless on the bench, demanding that Dykes play him. When Dykes expressed concern because the cheek was still swollen, Kaline replied “I don’t bat or throw with my cheek.” Kaline was selected to start in the All-Star Game, this time over fellow center fielder Mickey Mantle. Kaline also got his 1,000th career hit off Billy Pierce of the White Sox. The Tigers finished in fourth place, while Kaline finished second in the batting race with .327 to Kuenn’s .353. Kaline also picked up his third Gold Glove. In 1961, the Tigers hired Bob Scheffing as their new manager. Scheffing immediately turned to Kaline to become more of a leader, and the star responded. Kaline was not vocal but led by example, stepping up when needed. Kaline flourished all season, and was chosen to for seventh All-Star Game. He ended the year second in the batting race with a .324 average, and was voted AL Comeback Player of the Year. In 1962, Kaline began the season by expressing the desire not only to play in the World Series, but to have a 20-year career. He also decided to be more aggressive at the plate, citing his low number of strikeouts from the previous season as the reason. Kaline shot out to .358 by May 21, but that good fortune ended five days later in Yankee Stadium. In the bottom of the ninth with two out and the Tigers leading 2–1, Elston Howard hit a fly to shallow right. Second baseman Jake Wood and first baseman Norm Cash could not reach it. The only hope was for Kaline to make the grab. He dove for the sinking ball, landing on his right shoulder. Kaline made the catch but broke his collarbone. It was predicted that he would miss at least two months. Before the game, Scheffing told reporters, “We’re where we are because of Kaline. Where we go from here depends on him.” Scheffing did not realize how right he was. During the 57 days that Kaline missed, the Tigers lost 7.5 games in the race for the pennant, falling to 10.5 games back. The layoff was not all bad for Kaline, though, as Louise gave birth to their second son, Michael Keith. Kaline was also chosen to start the first of the two All-Star Games that season—his eighth straight start—but could not play because of the injury. By the time the season was over, Kaline hit .304 and 29 home runs, two more than his previous best, all while missing 54 games. The Tigers finished 10.5 games behind the first-place Yankees, but Kaline earned his fifth Gold Glove, and finished sixth in the AL MVP voting. As the 1963 season began, Kaline again changed his approach, deciding to get on base more, and let the slugging duo of Cash and Colavito drive in the runs. The team started slowly, but Kaline’s approach kept him hitting well enough to be chosen for another All-Star Game. Kaline battled a knee injury all season, which eventually cost him a batting title to Carl Yastrzemski when he was forced to miss a few games. He finished second with a .312 average to Yaz’s .321, hit 27 home runs, drove in 101 runs, placed second in MVP voting, and earned his sixth Gold Glove. Kaline experienced more injuries in 1964. He injured his left foot, the same foot on which he had had surgery as a child, while running in a spring training game. Kaline hid the injury from manager Charlie Dressen at first, believing he could overcome it. By the end of April, however, the injury became too painful, and Kaline was forced to sit out a few games. Still, he was chosen to the All-Star Game for the tenth straight year, but withdrew due to injury, saying the rest would do his foot some good. The Tigers finished in fourth place that season, and Kaline finished with a respectable .293 average and his seventh Gold Glove. Kaline’s average dropped to .281 in 1965 while he was wearing a special shoe to protect his foot. He did earn his eighth Gold Glove splitting his time between center field and right field. During the off-season, Kaline had surgery on the foot. It helped him hit better in 1966, which became a tough year for the Tigers on and off the field. Dressen, who missed time the previous season after a heart attack, fell ill again on May 16. He was replaced by coach Bob Swift, who himself was diagnosed with cancer that season. Dressen and Swift both died later in the year. Frank Skaff finished the season as manager. Despite the distractions, Kaline was chosen for his 12th straight All-Star Game, and helped the Tigers finish third, while hitting .288 with 29 home runs. He also earned his ninth Gold Glove. The Tigers had high hopes for 1967 under new manager Mayo Smith. Smith moved Kaline back to right field. Kaline was chosen to the AL All-Star team for the 13th year in a row, but a freak injury kept him out for 26 games. After a strikeout in a frustrating loss to Cleveland, Kaline slammed his bat into the bat rack and broke his hand. Unlike 1962, the Tigers stayed in contention without Kaline, going 15–11. The Tigers battled all year, but finished tied for second behind the Red Sox. Kaline hit .308 with 25 home runs (including his 300th) and 78 runs batted in, despite missing 31 games. Kaline won his 10th and final Gold Glove. The Red Sox lost to the St Louis Cardinals in the 1967 World Series. It would be that same Cardinals team against which Kaline would live out his dream. Nineteen sixty-eight was a season of new endeavors. During the off-season, Kaline, now 33, withdrew from Mapco to focus on baseball. He played in his 2,000th game April 18 in a 5–0 victory over the Indians. Kaline hit his 307th home run on May 19, passing Hank Greenberg as the Tigers’ career homer leader. The success was short-lived; Kaline’s arm was broken by a Lew Krausse pitch just six days later, and he did not return until July 1. In Kaline’s absence, Jim Northrup took over right field and played well. When Kaline returned, he was used mostly as a pinch-hitter, and filled in at first base. Despite the reduced role, Kaline figured prominently in the pennant run. He scored the tying run in Denny McLain’s 30th victory on September 14. On September 17, Kaline pinch-hit for Norm Cash, and ended up scoring the run that won the Tigers the pennant. After the game, Kaline told Smith he did not deserve to play in the World Series because other players had stepped up in his absence. Smith, knowing what Kaline meant to the Detroit organization, had other ideas. To get his star in, Smith put center fielder Mickey Stanley at shortstop, Jim Northrup in center, and Al Kaline in right. The move proved successful as the Tigers rebounded from a three-games-to-one deficit to win three straight games, including Game 7 over Bob Gibson. The Tigers had won the World Series behind Kaline’s .379 batting average and two home runs. Kaline had reached one of his goals, to play in the World Series. Now it was time to fulfill his goal of a twenty-year career. As Kaline marched toward that mark, he continued to hit, and gain accolades. In 1969, he was voted to the Greatest Tiger Team of All Time. August 2, 1970, was Al Kaline Day, upon which the city renamed Cherry Street behind the stadium Kaline Drive. In 1971, Kaline was selected to play in his 17th All-Star Game, held that year in Detroit. He went 1-for-2 and scored on a Harmon Killebrew home run in the bottom of the sixth. On July 1, 1972, Kaline hit his 369th home run, tying Ralph Kiner for 18th place all-time. He also helped the Tigers to the playoffs, in which they lost to the eventual champion Oakland Athletics. It was also Kaline’s 20th season in the big leagues. The 1974 season was Kaline’s last, and his first as a full-time designated hitter. He was named to his 15th and final All-Star team. He rapped his 3,000th hit September 24, a double off Dave McNally, in his home town of Baltimore. Kaline finished his career with 3,007 hits, 498 doubles, 75 triples, 399 home runs, 1,622 runs scored, and 1,583 run batted in, while batting .297. What makes his numbers even more impressive is the fact that he missed 594 games in his career, the vast majority due to injury—the equivalent of two-and-a-half seasons. With a career .987 fielding percentage, he was also one of the best fielders of his time, with 10 Gold Gloves to prove it. In a 2001 Sporting News article, both Ernie Harwell and Yogi Berra declared that Kaline had the best arm in the outfield ever. Kaline spent more time as a broadcaster—25 years—than as a Tigers player. He also participated as a spring training instructor, even teaching a young Kirk Gibson about playing the outfield. In 2001, Kaline left the broadcast booth to become a special adviser to Tigers owner Mike Illitch. In 2003, new General Manager David Dombrowski named Kaline and his former teammate Willie Horton as special assistants to the general manager. Because of the broadcasting and special assignments, Al Kaline has been associated with the Tigers for more than 50 years. For that, some people know him as Mr. Tiger. Others still refer to him simply as Number Six. Butler, Hal. Al Kaline and the Detroit Tigers. Chicago: Henry Regnery Co. 1973. Cantor, George. The Tigers of ’68: Baseball’s Last Real Champions. Dallas: Taylor. 1997. Harrigan, Patrick J. The Detroit Tigers: Club and Community 1945–1995. Toronto: University of Toronto Press. 1997. Hirshberg, Albert. The Al Kaline Story. New York: Julian Messner. 1964. Whitt, Alan. They Earned Their Stripes: The Detroit Tigers All-Time Team. Champaign, Ill.: Sports Publishing, Inc. 2000. Berra, Yogi and Ernie Harwell. “The Best I Ever Saw.” The Sporting News, July 9, 2001. Falls, Joe. “Summer Without Baseball: Kaline Making Adjustments.” The Sporting News, February 1, 1975. Salsinger, H.G. “Kaline More Like DiMaggio Than Cobb.” The Sporting News, October 5, 1955.